Drought Adaptation Industries "Drought Ring©" provides you with an all-in-one planting system that has been scientifically proven to save 95% less water while yielding 150% more crop. *First All-in-One Planting System on the Market! *Removes the Learning Curve to Growing Produce. 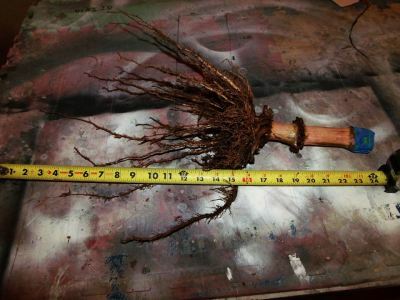 *Changes the Enviornment and Watering Dynamics for Ideal Plant Growth. *Scientifically Proven to Save 95% Less Water Per Production Year. *Increases Crop Yield By 150%. *100% All Natural Ingredients: Composted Cow Manure, Composted Worm Castings, Aged Green Compost, Rock Dust, and Additional Minerals. Soil temperatures in drought regions reach upwards of 150°F in the top 1"-2" of soil during Spring/Summer months in the Southwestern United States. Traditional gardenening dictates that you plant in that top 1"-2" of top soil. By planting deeper (5"-8") into the soil, you reach the "Golden Zone" of planting where temperatures remain a consistent 85°F - 95°F day and night. The raw materials in the Drought Ring© retain water similar to a sponge. The sponge like properties provide consistent ambient humidity ideal for plant growth in hot and arid climates. Drought Ring© has been scientifically proven to save up to 95% water during a growing season versus traditional hose end gardening. By watering only in the Drought Ring© you focus the water down so you get much more utility out of much less water. Less weeding (almost none) since the only place recieving water is inside the Drought Ring©. 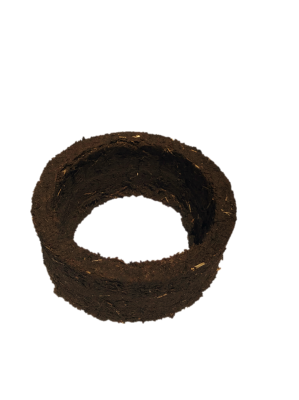 The raw materials in the Drought Ring© are 100% natural and include: Worm Castings, Cow Manure, Rock Dust, Aged Green Compost, Hardwoods and more. No additional ammonias or nitrates are used. The Drought Ring© is engineered to be sacrificial. Everytime it is watered it will "break off" parts of the ring and provide a feed for the plant. 4. Place seed pie in Drought Ring. If using seed, plant normally. 1. Dig a hold large enough to fit size of Drought Ring. 5. Put two handfuls of soil on top of seed pie or seed. 2. Place Drought Ring in hole. Make sure top of Drought Ring is in flush with the soil. 6. Fill ring with water once. If seeds rise, push seeds down 1" into soil with your finger and cover. Keep moist until plants reach top of ring. 3. Hollow out the interior of Drought Ring. 2" deeper than the bottom of the ring. Make sure soil at the bottom is loose. Mix in 2 handfuls of compost.